“We’re all going on an Expedition,” said Christopher Robin. I thought I knew what was going to happen, but I didn’t really. Greenland 2018 started off as a ski sail trip, but mutated into something quite different. 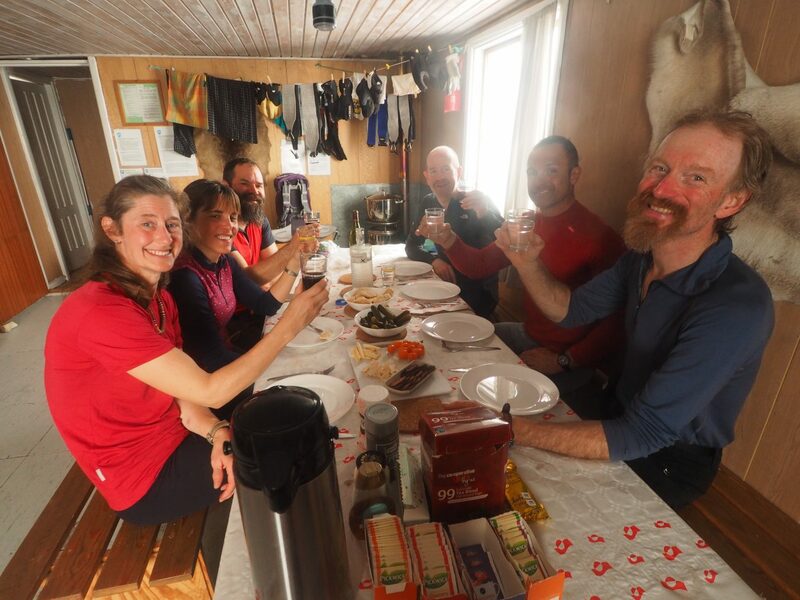 Having been in Iceland with Andy and Janice from Yacht Destiny, we cooked up a plan for them to overwinter on the west coast of Greenland, and then we’d meet them and spend 2 weeks on board their beautiful custom built boat, ski the challenging terrain during the day and relax on board their floating hotel at night. The immigration authorities in Greenland had other ideas however, and put a maximum stay limit on the Destiny team. So they ended up overwintering on a motor yacht in the Pacific while Destiny was lifted from the water and stored in a different port to the one we planned to use as a ski base. Not to worry though – they would return to Greenland a couple of weeks before us, get the Destiny in the water, sail down and meet us. All flights were booked, and we had 2 teams of 4 skiers ready to go with the first crew flying out with me in late April. In late March while ski touring in the Dolomites, Andy and Janice sent me an email entitled “Ice Problems”. The port where Destiny was stored was choked with frozen sea ice, as was the coast all the way down to our proposed ski sail base. It might clear in the intervening month, but it might not, and so we should look at a plan B, and then hope that the team would go with it. Plan B, rapidly put together by Andy and Janice with a huge amount of help from the local logistics operator, looked very different to a ski sail week. 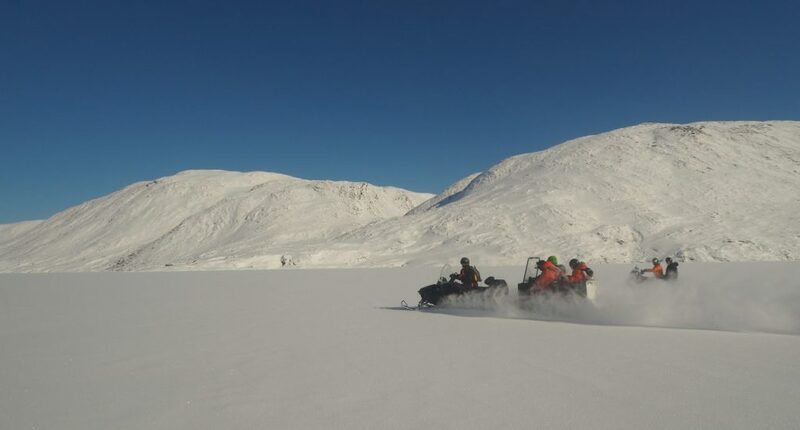 We would change our internal flights, get snowmobile transport for a couple of hours into a hut owned by the local commune, and explore the surrounding area which had only received 2 or 3 visits from ski tourers in the past. We would be the first guided teams to go in. What could possibly go wrong? “It’s just a thing you discover,” said Christopher Robin carelessly, not being quite sure himself. 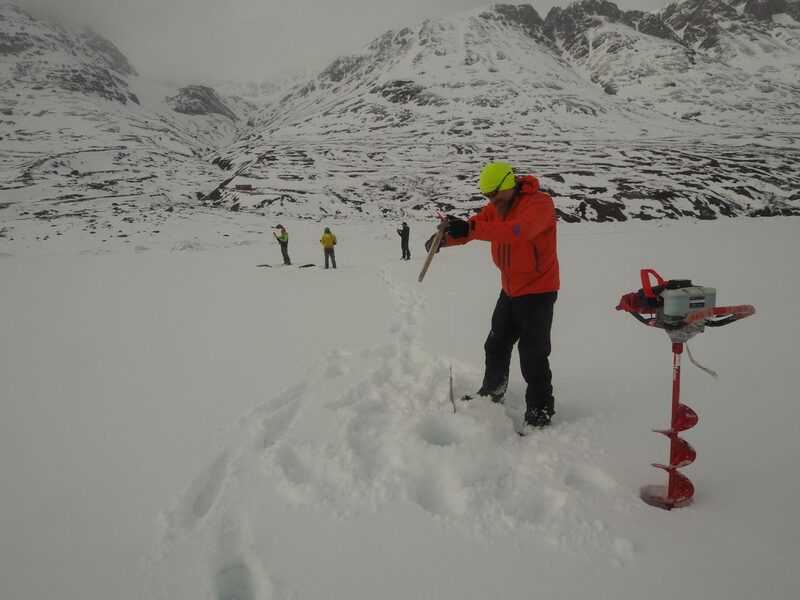 Ice fishing for Arctic char. Others needed gentle persuasion. 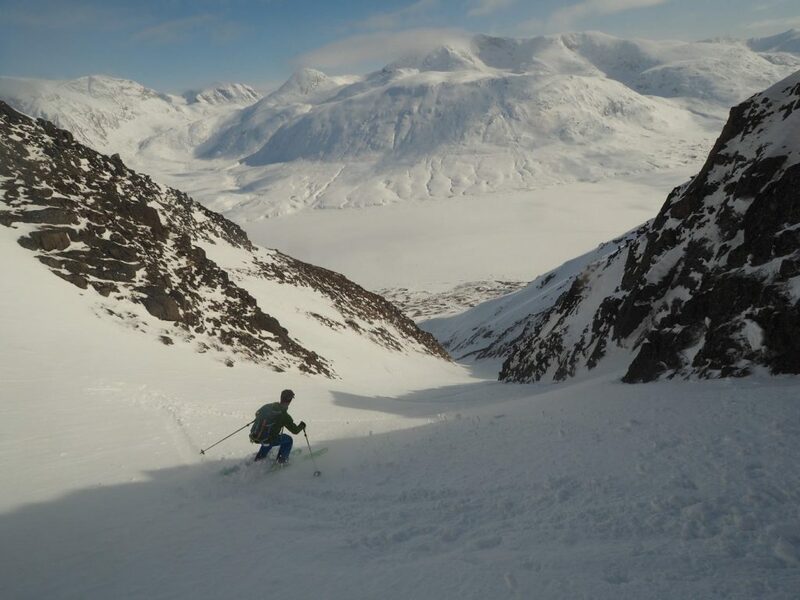 The key for me was the trip was not about the skiing, but about the totality of the experience: going to an unknown area with the opportunity to ski new lines, meeting the locals, unusual transport logisitics and so on. I emailed and called, cajoling people with the message that adventure is all about the unknown, and that expeditions are adventures taken to the next level. “Just think of it as an expedition, not a ski holiday, and it will all be fine”. Within a couple of days, the team had all got their heads round the idea. Next step – change flights. This proved problematic, to say the least. For the next week, I was skiing off piste in Courchevel, and trying to find a way to link our existing international flights from Copenhagen with a new internal leg. With two weeks to departure, I eventually found a way to get us all to the start point, but so far there was no valid method of return. Still, I thought, we can worry about that once we’re there. Meanwhile, I set about looking at this totally new area and tried to work out what might be possible with the two teams of skiers I would be with. Research for Himalayan expeditions in the past had involved visits to the dusty shelves of the Alpine Club library in London, meeting other expedition climbers in pubs and poring over boxes of black and white pictures. In Baffin Island in the early 80’s, Doug Scott gave us prints from his first ascent of Asgard, and we had aerial shots from the Ministry of Mines in Canada. Fast forward 35 years, and research is a little different. 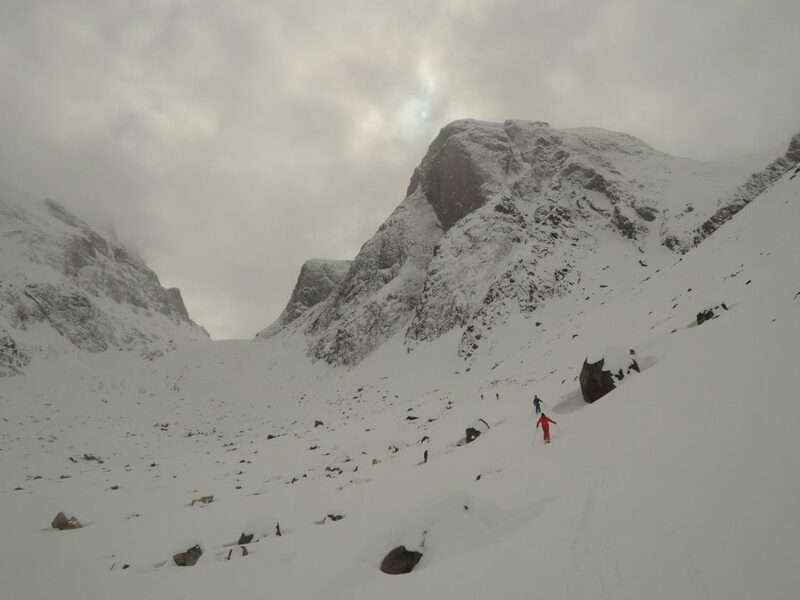 We had a PDF of a report from some pro skiers who’d been for a recce the year before, raved about it and recommended some plum unskied lines. 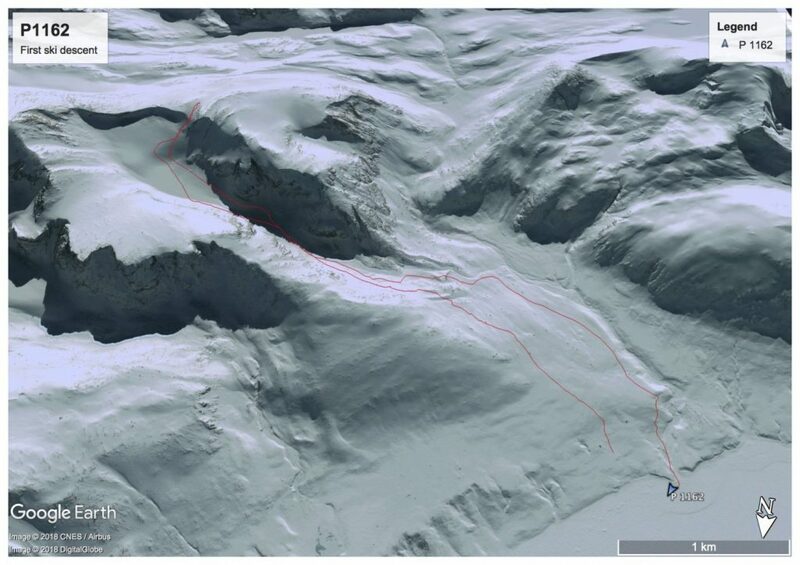 I checked these out on Google Earth and sketched in their lines in an attempt to gauge what was skiable in reality. A week before departure, I went to an evening seminar on use of smartphones in the mountains. The expert, an instructor from ENSA ( the national French mountaineering schoool ) , gave a simple and practical talk on apps for navigation and weather forecasting. 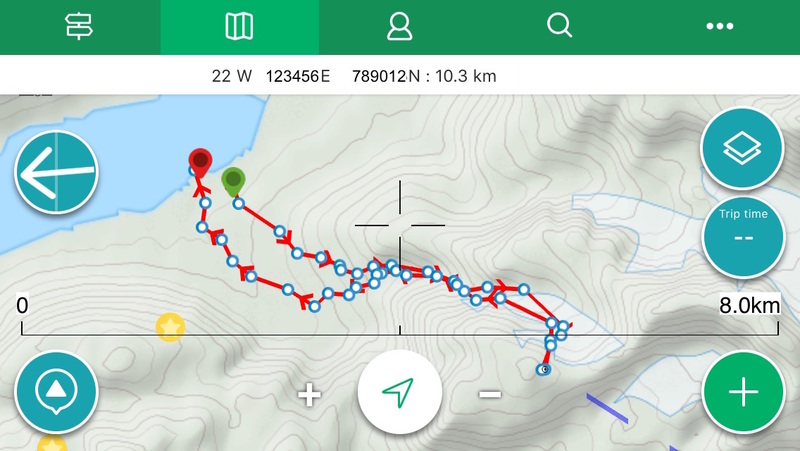 At the Q&A, I asked: “So if, in theory, I was going to Greenland in a couple of weeks with no maps other than some paper 1:100thou , a Garmin with no basemaps and an iPhone, I could use this app?”. “Mais oui naturellement” he replied with a twinkle in his eye that said “we’ve all been there, mon ami”. It was the most relevant and effective continuous professional development training I’ve done as a mountain guide for many years. Newly confident and enthusiastic about electronic nav, the night before I flew to Copenhagen I received some GPS files from an Italian guide via Whatsapp. I loaded these via my laptop into my phone, overlaid his real-time tracks into Google Earth, and then uploaded these via Kindle to my phone and tablet as well. How times have changed! “We’re starting,” said Rabbit. “I must go.” And he hurried off to the front of the Expotition with Christopher Robin. The arrangements at Copenhagen went smoothly, but on arrival at the airport hub in west Greenland, it became evident that there was still a massive administrative hurdle to be surmounted to get the return flight organised. 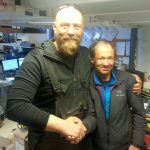 We had been trying for over a month, from the CEO of Air Greenland down to the check in team at the airbase from where we’d depart on snowmobile, and had run into a brick wall. The stress levels were pretty high, with a worst-case scenario being purchase of new international flights and, even then, no guarantee of connecting our existing domestic flights. I recalled an expedition to Ama Dablam in the late 80’s where Andy Cave had been out a week in advance to try and get our permit ( theoretically sorted but proving bureaucratically elusive ). When the Ministry of Tourism finally relented after a week of efforts and left the office to get the permit stamped, Cavey whipped round the other side of the desk, did a headstand on the official’s chair, and I snapped a quick photo. If you push on enough doors, eventually the right one will open. At least that was my mantra as the hours ticked by towards our departure to the hut. Once there, I knew nothing would happen and we’d be facing a massive bill and potentially the team unable to return to the UK for a few days. But with 30 minutes to go, the combined effort of our logistics guru Bo, his wife Annette who runs the hotel, Andy and Janice from the Destiny and me maintaining my Himalayan mentality paid off. We found the person at Air Greenland with the authority and the capacity to say yes. The door opened, the light shone through and we were on our way. As I said to Annette as we left – “now we can do the easy bit – finding the best snow”. With a superb team of local snowmobilers, we headed into our base camp hut, a few hours ride from the airstrip. The first week went brilliantly, with a small fall of fresh snow with no wind making for great conditions with relatively low avalanche risk. I was still very aware that we were a long way from help should anything happen. 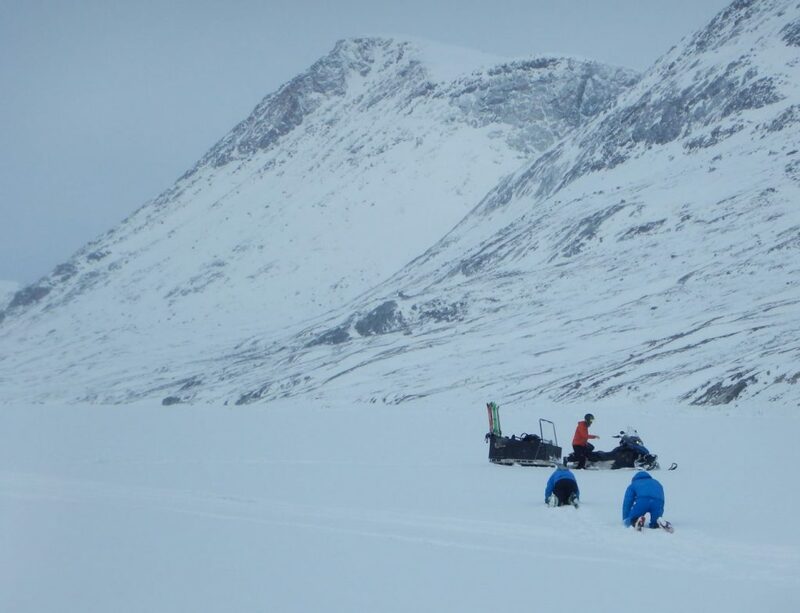 Even with VHF to keep in touch with the base, one satellite phone in the hut and another with the team on the hill, we still were genuinely on our own, the only skiers in a wilderness of thousands of square kilometres. We had one day where it was snowing and blowing. Festering is all part of the expedition experience, though sitting out bad weather while Janice baked a Victoria sponge cake was a little different to playing bridge in a Karakoram base camp with a bunch of hairy arsed Himalayan alpinists in the 90’s. There came a sudden squeak from Roo, a splash, and a loud cry of alarm from Kanga. “Roo’s fallen in!” cried Rabbit, and he and Christopher Robin came rushing down to the rescue. Andy Perkins and Matt Madden failing to keep their feet dry. The group for the second week had a challenging time getting in. In the middle of a snowstorm when all the locals were saying there was no chance of the plane getting in, the Air Greenland pilot managed to land on his second attempt. Adrenaline levels were clearly high as the team stepped into what passes for an arrivals hall, and we spent the rest of the day being tourists, petting huskies and eating cakes. 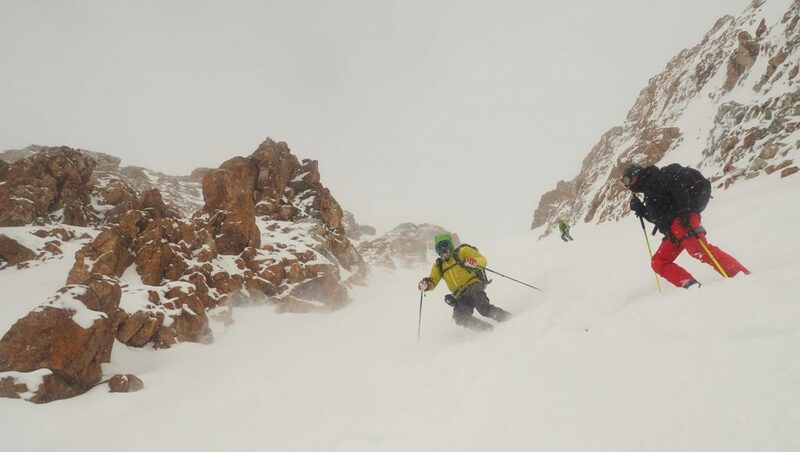 With a load of snow and high winds, the avalanche risk for the ensuing few days was feisty, so we stuck to low angle terrain until things settled down. The weather was also warming up. Winter transitions through to summer very rapidly at Arctic latitudes, and sea water was starting to push through cracks in the sea ice in the latter stages of the week. We spent one memorable morning getting the ski bus bogged down in knee deep slush, eventually man-hauling it back to more solid terrain before retreating to the hut to dry out ski boots for a few hours. The day was not wasted though – in the afternoon we went up a steep couloir directly behind the hut. Matt skied some of the most committing turns of his life, Nick got a kick turn work out, Stuart read his book in the sun on a ledge and Alan drank beer in the hut, listened to the radio chat between me and Destiny mobile and quietly chuckled. And we all got a ski tow back to the hut afterwards. It might not have been the hardest highest fastest day ever, but we learned loads and skied some great snow. Christopher Robin wasn’t listening. He was looking at Pooh. Kasuta, as we say in Greenlandic. Keep pushing on closed doors. Eventually one will open, and one is all you need. ← How’s the snow in Chamonix?